Pop/rock singer-songwriter, Mikey Wax talks with College News. A native of Oyster Bay on Long Island, New York, Mikey Wax discovered his passion for music at just 8 years old when he began singing and writing songs. Inspired by Billy Joel, The Beatles and Elton John, it was evident that he was a natural songwriter. In 2009 he released his debut album, Change Again which received a strong reaction across social media platforms. His single, “In Case I Go Again” was feature on YouTube’s homepage and has had more than half a million views. As a result, his album soared to the top 100 on the iTunes pop chart in four countries including the US, UK, Canada and Australia. 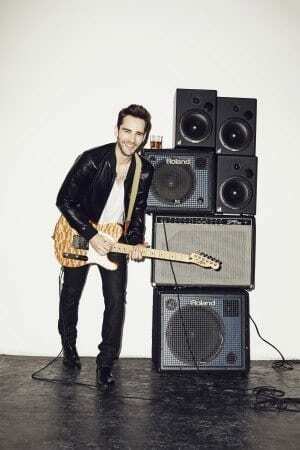 Mikey has performed with the likes of Howie Day, Jon McLaughlin, Tony Lucca, Andy Grammer and more. With the recent release of his self-titled label debut, Mikey Wax has been on the road this summer sharing new music with fans and took time to talk with us about his growth as a musician, Pretty Little Liars and future plans. You grew up in Long Island where you learned to play piano and started writing songs. Did the Long Island music scene have any influence on your work as you discovered your passion? I never got too involved in the music scene that was happening on Long Island so to speak. I was, however, very inspired by my friends and family, and the scenery in the town I grew up in called Oyster Bay. My house was surrounded by tall trees, and the piano was in a nice open room with high windows and was very inspiring. You attended Vanderbilt University in Nashville, was music your field of study? Music was originally my major, but it quickly became homework, and something that felt more like a chore. When that happened I really couldn’t enjoy it the same way. For me music was always the escape. So I changed majors and through that, stayed in love with music. In 2009 you released your debut album, Change Again, in what ways has your sound evolved since your debut album and your latest album? My music has definitely become more upbeat and positive. My first record was a much moodier and conflicted album, which I attribute to a bad breakup at the time and being uncertain what direction I wanted to take my life. These days, I’m a little more confident and see the glass as half full. Your song, “In Case I Go Again” was picked up for an episode of Pretty Little Liars late last year, what was your initial reaction when you found out? I was really excited to hear the news, and immediately ran to share the update with my fans. I’m always so appreciative when a TV show feels my song can add to a scene. It’s especially rewarding when my fans tell me they tuned in and jumped up with excitement when the song came on. Is there a TV show you just can’t get enough of? Hah, I’m pretty addicted to the show Pawn Stars on the History Channel. I like to geek out a bit and I’m interested in history and how things came to be. You recently released your self-titled label debut album. What inspired the songs on the album? I knew I wanted to make a feel good, upbeat album, so that was always a factor in prepping each song. But beneath all that, this album is really a big thank you to all my fans for their support over the years. They’ve kept me going, and I wanted this album to be joyful. Do you think the album is a true representation of your artistry? I don’t release any album until it’s gone through a very intense process of self-criticism and overanalyzing. I feel everything I release is true to me. What are your plans for music looking ahead? To keep writing the best songs I can, giving all my heart and brain power to putting everything I have towards my music and performances. Hopefully that will continue to reach new fans and allow me to keep doing what I love.